Standard Rate policy: If cancelled or modified up to 30 days before date of arrival, 1 night will be charged. If cancelled or modified later, 100% percent of the total reservation will be charged. In all other circumstances whereby a prepayment % has been agreed to (such as Early Bird Rate) by both parties and paid at time of booking or anytime thereafter, the prepayment is non-refundable. Non-refundable bookings charged full price upon booking. Cancellation Policy This policy defines how to handle cancellations of General/Standard Rate Booking. If cancelled or modified up to 30 days before date of arrival, 1 night will be charged. In all other circumstances whereby a prepayment % has been agreed to by both parties and paid at time of booking, the prepayment is non-refundable. Any outstanding balances due for the reservation shall be paid 1 month before arrival. For larger transactions whereby payment instalments have been agreed to over and above the initial deposit payment to secure reservation, processing charges will be incurred by the customer in case of cancellation and refund of such instalment payments. The processing charge to refund that instalment amounts to 4% and shall only constitute the original amount received by us in Euros. The amount you are refunded may be less than the amount paid to us initially due to processing charges as well as currency exchange rates. This is a risk you are accepting when you accept this option. You also agree to effect payments on the dates agreed to at reservation time for any instalments. Failure to pay such instalment within 48 hours of the dates agreed to shall cancel the reservation instantly. A damage deposit of €200 is due on your arrival at the apartment either in Cash or credit card authorisation and will be refunded to you on your last day. Credit card authorisations may take 2-4 weeks to clear depending on your credit card issuing bank. Longer stays may require a higher damage deposit and shall be communicated to you via email. For payments effected by credit cards we may be required by our credit card processing bank to provide a copy of Credit card holder identity document such as passport, driving license or national identity card. Bookings must be made in the name of the credit card holder. In case where a free cancellation booking option is selected, a preauthorisation of [PRICE] shall be made on the credit card to ensure that it is valid. Checkout is between 7 and 10am. Please inform us earlier if you intend to leave during the night. We always meet guests prior to their departure to ensure a satisfactory stay. The client shall inform the lessor of their time of departure so that checkout shall be arranged at any mutually agreeable time and property inspected prior to departure. Vacating the property without notifying and meeting the lessor for inspection of the property shall constitute breach of this agreement and forfeit the damage deposit in full and lessee shall be liable to any other damages found on the premises. Should you desire additional housekeeping during your stay, this is possible at a fee of €40. Supplementary bath towels may be had for €1.50 each. Should we need to call at the apartments between 23:00 and 07:00 for reasons other than check-in and in particular due to negligence of the guest or any other circumstances which responsibility does not fall within our remit, a late night disturbance fee of €75 applies and shall be debited from the damage deposit. This policy defines the possibility of accommodating children and the availability of extra beds. All children are welcome. One child under 3 years stays free of charge in a child's cot/crib. The maximum number of children's cots/cribs in an apartment is 1. The maximum age of children that can stay for free in an apartment is 3 years of age. Clients should inform the Accommodation prior to their arrival the estimated time they plan to check in. Please note that if you are taking a bus, your arrival time at the property may be late. We kindly ask you to inform us how you plan to travel so that we may take this into consideration. Cab service is available at a fee. Each customer is provided with a stipulated allowance to cover general utilities usage while at the apartment. Should this allowance be consumed, additional electricity cards of €10 or €20 may be purchased directly from us. Between November - March, the utility allowance provided is reduced to 20kwh daily to reflect the discounted rates. Should you wish to have additional heating allowance, you may purchase it at time of booking or on site when you arrive. Once utility allowance is used up, the supply is cut. Each utility meter is visible and remaining allowance can be checked at any time you desire. Any damages and breakages during clients’ stay will be charged. A refundable damage deposit of €200 is required at arrival and refunded prior to departure together with a passport copy. We may ask for your credit card details on arrival as a security in case of damages. An inventory is available to confirm the cost of an item. Should an item not be present on the inventory for any reason whatsoever, the cost of its closest replacement will be charged. Gas heaters maybe provided at a cost of €22 euros per tank. Keys: You are supplied 2 sets of keys on arrival. Lost keys incur €5 fee per set. A standard lease agreement will be required to be signed on your arrival. The currency shown for each property is in Euros and you will be charged in Euros. Any other currency conversion feature on the website is for reference purposes only and unless otherwise informed, you shall be billed the amount shown in Euros. Prices shown in other currencies than Euros may change from one day to another as well as the base price in Euros according to the inventory available. One of the most sought after beach side properties in the area with excellent guest feedback on multiple sites. This nicely furnished 1st floor apartment offers self-catering accommodation just 3 minutes walk from the largest sandy beach and 200 meters from the rocky seaside. It has a balcony over looking the beautiful countryside and village views and a rear terrace. There is a bus stop in front of our property as well. Located in the northern part of the island by the seaside, it ensures a relaxing stay away from city life yet minutes from anything you may need! 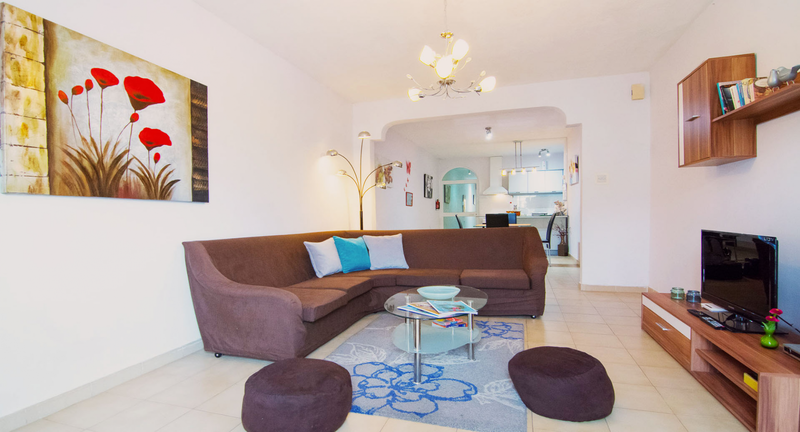 It is a licensed holiday rental by the Malta Tourism Authority. Groceries, restaurants and pubs are a located in the area to facilitate your life. 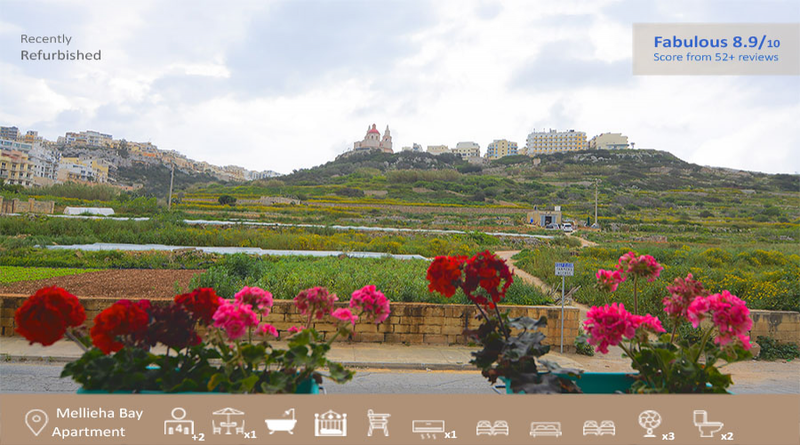 The spacious balcony allows unobstructed views of the Maltese countryside with a glimpse of Mellieha's towering church at the forefront. During the festive summer season, this beautiful church will be lit up to reflect the splendor of the village. The ferry to the sister island Gozo is just 10 minutes away. The apartment is spacious ideal for families and divers seeking to enjoy the treasures of the Mediterranean. All rooms have been refurbished to provide you with a relaxing environment for your entire stay. A nice variety of books is also available. The kitchen and media room are well illuminated thanks to a large balcony and are adorned with numerous plants and flowers. A terrace can be found next to the main bedroom. Parking in front of the apartment is free. Getting here: If you are taking the bus from the airport, take the X1 from Luqa airport and stop in Mellieha next to belle view interchange bus stop number 972 then take bus 41 or 42 and stop at Tunnara bus stop no 980. Wait for us there:) Check the transport website at publictransport dot com dot mt. All these bus stops are visible on google maps. Rent a car with us and we will take care of everything. Discounted offers for guests. before date of arrival, 1 night shall be charged. NO SHOW, total price of reservation will be charged. Prepayment: No prepayment needed however Credit Card preauthorised atleast 30 days prior to your arrival. of Cancellation.See Cancellation Policy above for Coupon. Booking terms: Please note if cancelled, modified or in case of no show, the total price of the reservation will be charged. Prepayment: The total price of the reservation maybe charged anytime after booking. Coupon Code Not Valid For this Rate, It is already discounted. We reward those that are committed most to their travel arrangements by offering better rates. Prepayment: 35% will be charged at time of booking. Cancellation policy: If cancelled up to 30 days before arrival, 35% is charged. If cancelled later, 100% is due. See T&Cs for further information. Coupon Code Not Valid For this Rate, It's already discounted.